After the bustle and business of places like Prague and Vienna, we were quite pleased to find out that Budapest was pretty much void of tourists. The first night we were in town, Tiffany and I walked out to take some photos of Budapest expecting to be holding out our elbows to maintain our positions. Instead, we felt like we had the city to ourselves. It was the same with the accommodation, we had our hostel to ourselves. We had the pleasure of staying at a small hostel right in the center of the action of Budapest called 7×24. 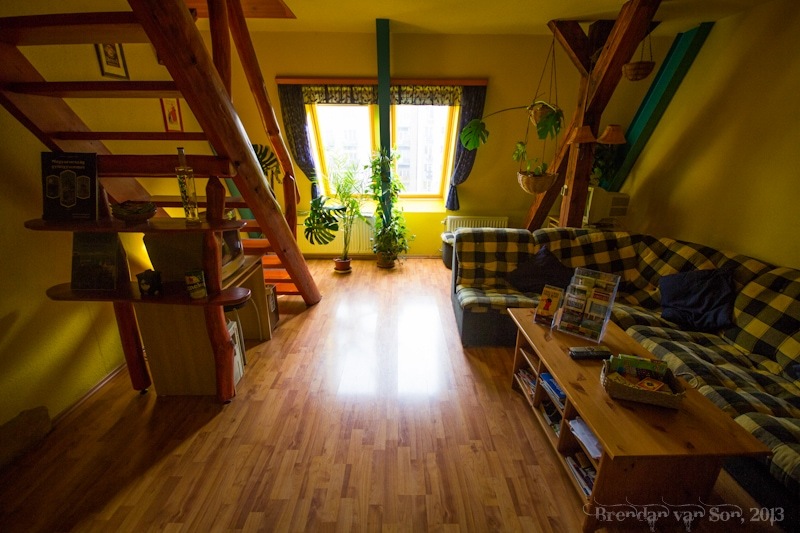 Unlike the massive party hostels in the area, this is a quiet, personal hostel, with a family feel to it. Below, you’ll find my review. You won’t find a better location. Well, not at this price anyways. 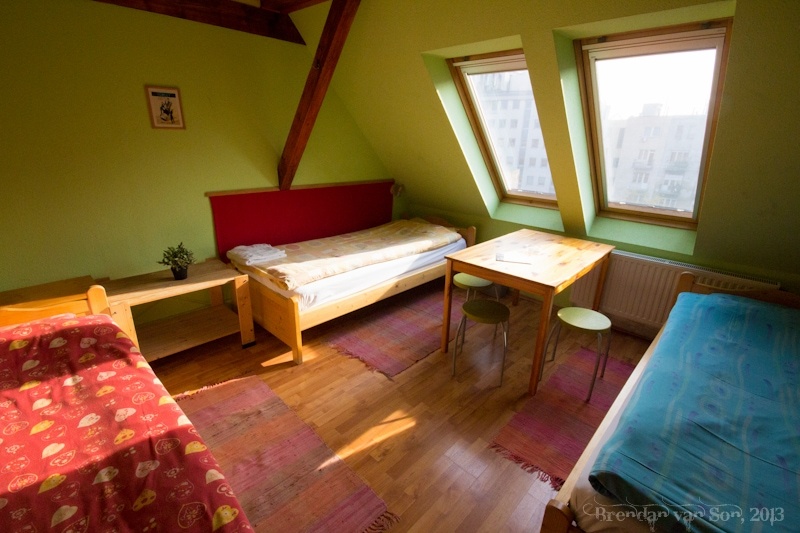 The hostel is located right above the main strip of hostels, restaurants, and pubs. The bonus is that since it’s up a couple floors and on the inside of a building there is no street noise at all in the rooms. You’re a 10 minute walk from the river, at the most. It’s take you about 3-4 minutes on foot to get to the nearest underground station, and is linked to just about anywhere in the city. The rooms are all quite good, but nothing fancy for sure. The private rooms are quite small, but more than enough room for your average budget traveller. The bathrooms are quite small as well in the hostel, although you’ll not hear a complaint from me. My one complaint is the lighting in the rooms. The lights in our room were very weak during the day, but somehow during the night they still glow a bit meaning that the room was not completely dark. 7×24 Central Hostel has pretty much everything you need as a budget traveller. There is WiFi throughout the hostel which runs at a very respectable speed. 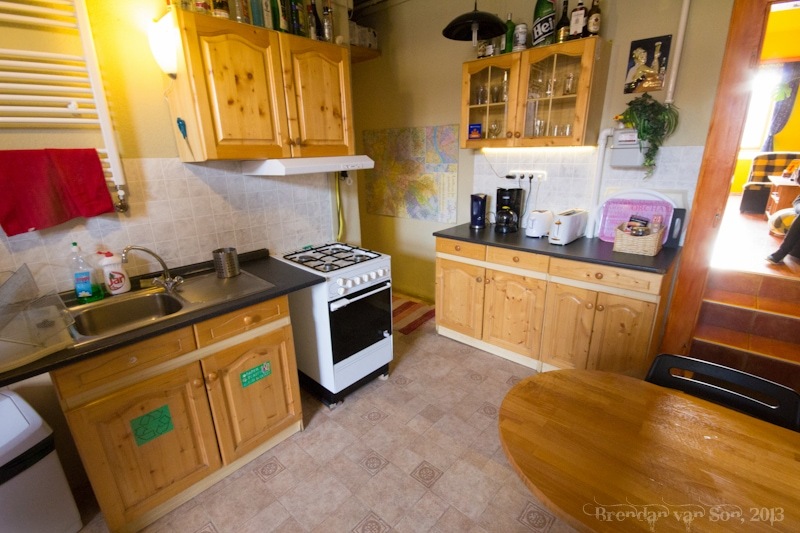 There is a small kitchen, fit with coffee and tea, for guest use. There is a nice common room loaded with couches and chairs, which would a nice place to hang or meet other travellers during the high season. The dorm rooms all have enough plug-ins which is cool. There is even a Foosball table in one of the dorm rooms. Good set up all around. The atmosphere of 7×24 Central Hostel is great. It’s much quieter and way more personal than you’d get at one of the big chain hostels. The staff will go out of their way to help you out, but give you more than enough free space to make you feel like you’re at your home away from home. All-in-all, the hostel is incredibly comfortable and I’d highly recommend a stay here! If you’re looking for a bit more information, or want to book the hostel, check their out website.